Sign up and receive Property Email Alerts of Apartments to let in Delmas West, Delmas. Safe and Secure 2 Bedroom units in a brand new Residential Development in Delmas. The development consists of 2 bedroom upmarket units, you have the choice of a ground floor, first floor as well as second floor unit. A Golf course runs through the development on both sides. Ideally situated near main routes and close to schools. The Development also offers optimal security features including an intercom system, automated access control and electric fencing. All units completed with non-slip ceramic floor tiles, vitreous china and acrylic sanitary fittings, white melamine built in cupboards and formic kitchen counter tops. 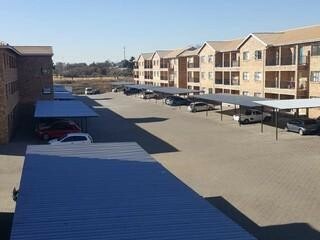 A separate designated washing line area is available as well as covered walkways, covered parking available. Nearby Hospital, Delmas Primary as well as Delmas High School. Within walking distance from shopping centers. Phase 2 now launching - with Club House and safe and secure play area with Jungle Gym for Children. Victor Khanye Municipality. Close to Exxaro mine, Rainbow Chickens, hospital. Sign-up and receive Property Email Alerts of Apartments to let in Delmas West, Delmas.